An updated proposal to replace the vacant Edgewater Medical Center with an apartment complex, single family homes, retail space and a park is ready to be submitted to the city for approval. Ald. 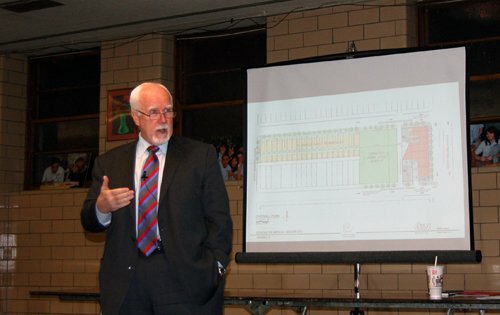 Patrick O’Connor (40th) unveiled the plan at a packed public meeting at St. Gregory High School on Wednesday. O’Connor said he hopes the city’s review process will be completed by September. The goal of the proposal is to deliver a “shovel-ready” project to prospective developers that already has the city’s approval. O’Connor said no developer would risk investing in the current site at 5700 N. Ashland Ave. to only then have to fight the city for approval. “A developer would not look at this site, put their money down and then spend months to years trying to determine what they could or couldn’t do working through the city because its taken these guys about eight to 10 years so far,” O’Connor said. The proposal, put forth by Waveland Partners who control the site for the bankrupt estate, features a 12-story building with 214 dwelling units along Ashland Avenue. The building would include a 13,975 square-foot retail space and two levels of parking. 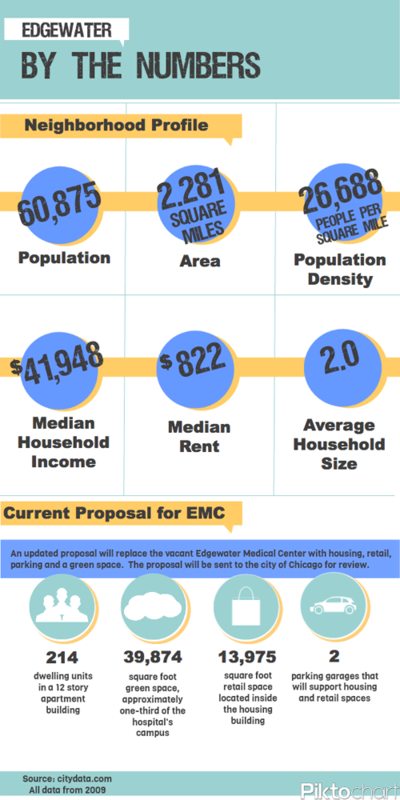 Previous proposals that included more dwelling units were rejected for increasing neighborhood density. Community members at the public meeting expressed concerns about whether the type of retail that would be housed in the main building would meet Edgewater’s independent aesthetic. O’Connor made it clear that the proposal cannot dictate that retail space be reserved for independent owners and kept out of the control of chain brands. “I think you try to create an environment that keeps it independent and unique,” O’Connor said. O’Connor said the space does not necessarily have to be reserved for retail, but it needs to house something that pays rent. The proposal also calls for a row of 19 single-family homes along Edgewater Avenue and a 39,874 square-foot green space, close to one-third of the medical center’s campus. O’Connor said the Chicago Park District has agreed to take the title of the green space, making it tax free. Inclusion of a green space had been a main concern of the community in accepting any proposal. Parks increase property value, bring communities together, and revitalize neighborhoods, Swan said. Although the proposal is ready for review, O’Connor said it is not final. The Edgewater Medical Center has been vacant since 2001 following indictments of fraud and bankruptcy.